If then statements show what might happen. If it rains, we will go bowling. Sometimes the possibilities are not real and we use the subjunctive case in the whole sentence. Sometimes the possibilities are real, but we haven’t decided what to do yet and the grammar gets a little confusing. If I eat a donut, I will be happy. If I had a donut, I would be happy. 1 Each picture shows a choice. 3 Write advice describing a good choice. 4 Write advice describing a bad choice. Giving advice is hard to do. It is hard to do emotionally, and, in English, it is hard to do grammatically. 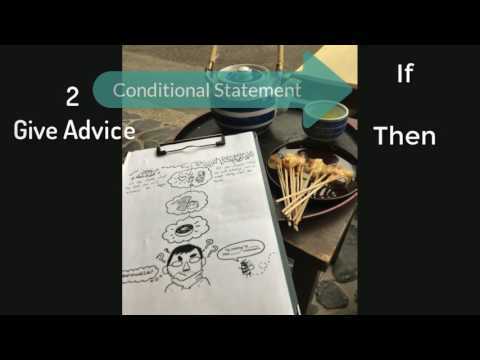 In English these are called conditional statements, because there is a condition. An If. The statements have an If, the condition, and a result. We learn them as a pattern of If… then… Although we don’t always use the word “then,” it is understood. Let’s practice, so we can give good advice well.